Pavlova is a meringue-based dessert named after the Russian ballet dancer Anna Pavlova. It is a meringue dessert with a crisp crust, and soft and light inside. It reminds me of a meringue cookie. The inner part of this meringue is like a little boat so you can stuff it with whatever you like when its done cooking. Since its St. Patty’s day weekend I wanted something especially for the holiday. I stuffed this little delight with Kiwis, Cool Whip and Orange marmalade in honor of the Irish flag, but you can use whatever kind of fruit you would like. I hope you enjoy it. Preheat the oven to 225 degrees F. Line a baking sheet with parchment paper. Set aside. In a stand mixer or hand electric mixer, beat the egg whites until thick, about 2 minutes on medium-high speed, slowly add the sugar, about a 1/4 cup at a time. Add the salt, cream of tartar, lime zest and coloring. Increase the speed to high and beat until the mixture has a stiff peak, about 3 to 4 minutes. Drop 8 Ice Cream scoops of the mixer on baking sheet about 2 inches apart. Using the back of a spoon make a little well in the center of each meringue. Bake for 2 hours. Turn off the oven and allow the meringues to cool completely in the oven for 2 hours. Then place whatever toppings you would like. These little goodies will last for about a week in a plastic container, if you can keep them around for that long. I love pavlova. 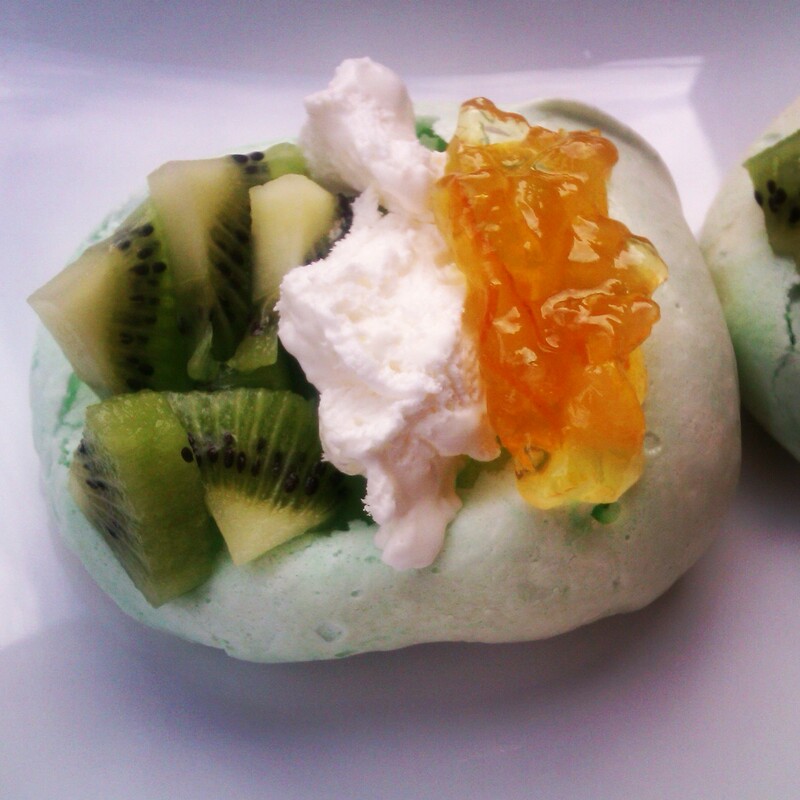 A green pav served with kiwi is perfect for St. Paddy’s Day. They really are a yummy treat.